White Apes concept art for John Carter, directed by Andrew Stanton. I was wondering who was responsible for that wicked design. NICE. Awesome stuff!!! Looks great... I would love to see how you paint. Have you ever recorded any video's? amazing one, looks so realistic! When I grow up... I would like to paint like you! Other thing that I Would like to see are yours sketches, and unfinished works, something like that, do you have a space for that stuff? I don't cease to admire your talent! only it is a pity that you show the works so seldom! Beautiful! I just picked up the art book too and love your other pieces in there as well. Igor Braulio: Thanks! Will post a pencil sketch of the White Ape later on. Felix Botho Haas: Thanks a lot! My recent work (which I can only post in 2 years) is more economic with the brush work, more indicative. Looks fantastic Michael, I look forward to seeing more! truly amazing, what a punch in the face! may I ask, do you have any advice in reaching such a high level of realism? Especially when the design is something unreal, making use of reference will only help me to a certain point? thanks and keep up the inspirational work! Beautiful work Michael. 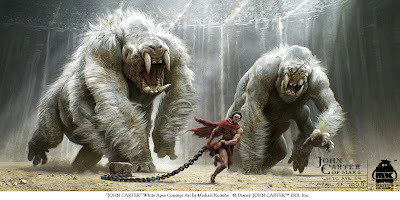 Just got the art of John Carter today. It's nice to see everyone's work, but I wish they gave the artists credit inside. Still an awesome book. They did indeed use it for the poster, but I think you're layout worked better. The poster has the apes cut off and the whole composition has a real sense of speed. Awesome stuff.